This was a little tricky for my little guy but if I had used all the same color for the shapes he wouldn’t have needed as much help, I think he was a little confused over which to match . 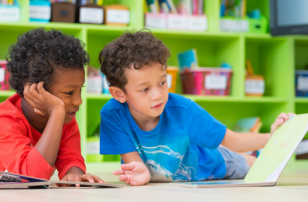 Even if your child doesn’t quite get it, as long as they aren’t frustrated they will benefit from playing with the shapes . Gather your materials. 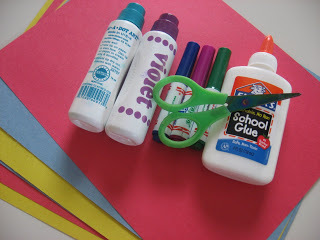 You will need 1 large piece of paper or wraping paper ( using the reverse), 3 pieces of contruction paper in 3 colors, scissors, glue and a marker. 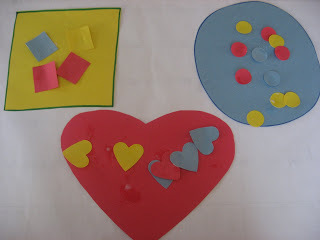 You can also use crayons, paint or markers to decorate the shapes. 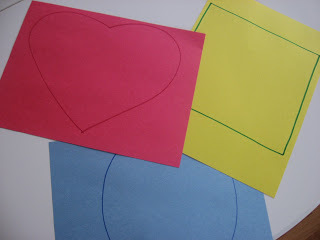 Cut out 3 large shapes. 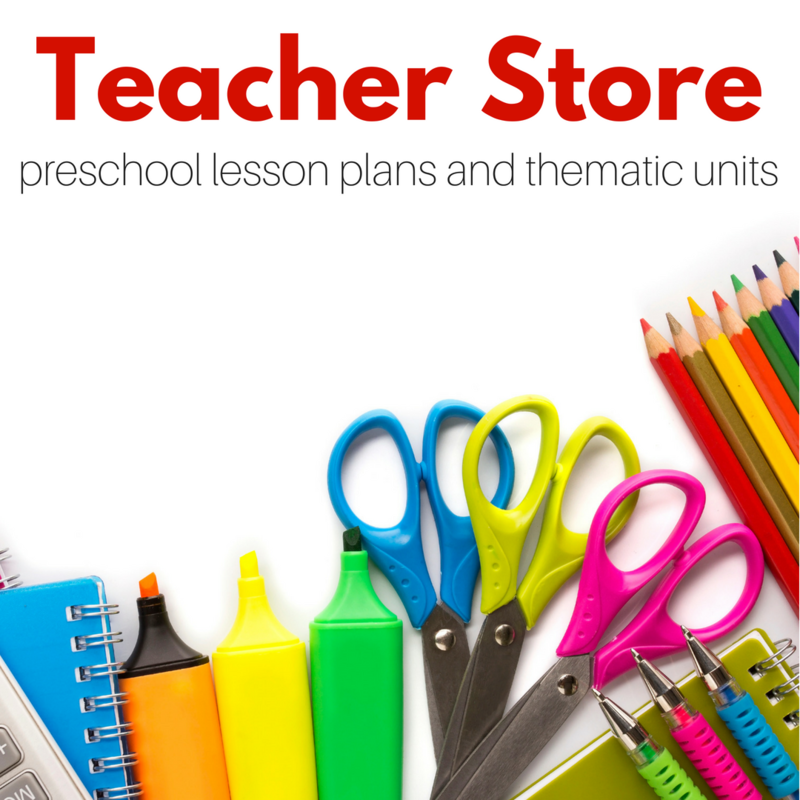 You can do more for older children and less for children just learing their shapes. 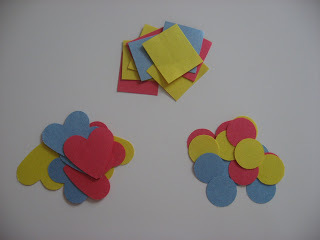 Cut our a bunch of small shapes that match your larger ones. 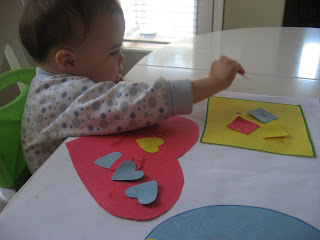 Here is where I messed up, I should have only used the same color paper for each shape , but with older children feel free to make is harder and even have them cut out their own shapes. 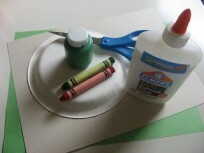 Glue your large shapes onto the big piece of paper. 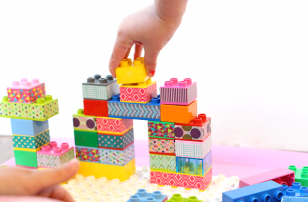 Start by giving your child just a few shapes and seeing if they know where to put them. You may have to help, that’s fine this activity needs a lot of parental involvement ( so no dishes or making dinner while you do this one ! ) . Once they figure it out, hand them the glue. Keep going!It took my little man a few times but he started getting it after a few minutes. 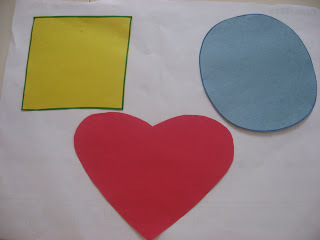 Hang it up and try to find shapes around your house that match too! 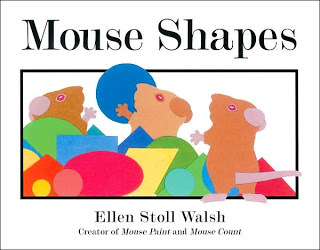 “Mouse Shapes” by Ellen Stoll Walsh is a cute book that ot only helps teach shapes it is also entertaining! The three crafty mice use the shapes to protect themselves from one hungry cat finally using them to make scary mice to frighten the cat away! 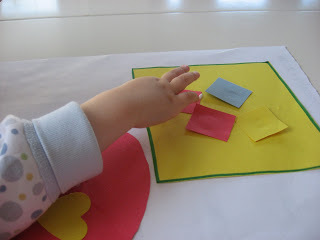 Kids love to help find which shapes are use in the authors collages and older ones can even anticipate what the mice will make next! Just want to say thanks for sharing all your wonderful ideas! I’m thrilled to have found your site! My son is 22 months, so I enjoy being able to see your little guy who is about the same age working on all the activities! Thanks again, I know these ideas are going to be sanity savers during the cold winter months! 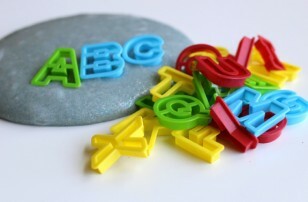 I just found your website today (from Hillbilly Housewife). 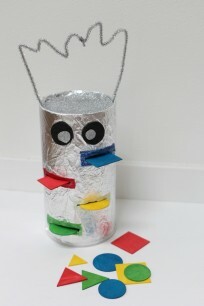 I love the Herman the Worm song…how fun! I’ll be back to check out your blog for more ideas. I love your blog. I check it daily.